As antiquarian booksellers we all know what the copyright of a title is. We know where to find it, how to interpret it and what it means. But do we know how it came into being? I would venture to guess that more than a few of us are in the dark about how copyright laws came into existence to begin with! Today we would like to particularly focus on the Statute of Anne – otherwise known as the Copyright Act of 1710, which went into effect 308 years ago today – and how it drastically changed how copyright law worked in Great Britain, naming the author, rather than the publisher, as the holder of the copyright! 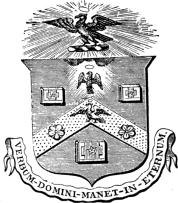 The crest of the Stationers Company in Great Britain. Prior to 1710, the law in effect in Great Britain was the Licensing of the Press Act 1662. Following the spread of the printing press brought over to the UK by William Caxton in 1476 (a prior blog on which you can read here), publishing and printing was widespread and copyright virtually nonexistent. The Licensing of the Press Act was enforced by a highly regarded guild of printers – the Stationers’ Company – who were given the “exclusive power to print and responsibility to censor literary works”. The censorship was thoroughly hated and disputed often, leading to public protests throughout Great Britain. As the Act needed to be renewed every two years to remain valid, authors and smaller printers protested its renewal repeatedly. Finally their efforts paid off in 1694, when Parliament refused to renew the Licensing Act, acknowledging that the ability of only a select few to print the works of an entire country had led to an unhealthy monopoly in the printing business. After the dissolution of the Copyright Act, authors were finally able to join the fray - standing up beside the stationers/publishers petitioning Parliament for a new system. Jonathan Swift and Daniel Defoe were two of the most notable authors of the time calling for new licensing (in particular calling for authors to have power over their own work). In 1705 Defoe wrote that without current licensing, “One Man Studies Seven Year, to bring a finish’d Peice into the World, and a Pyrate Printer, Reprints his Copy immediately, and Sells it for a quarter of the Price … these things call for an Act of Parliament”. Suddenly the lobbyists saw an opportunity – rather than lobbying because they were losing out on profit due to lack of licensing, they chose to lobby for the authors instead – their “hearts-of-gold” (we use this term loosely) winning out in the end. 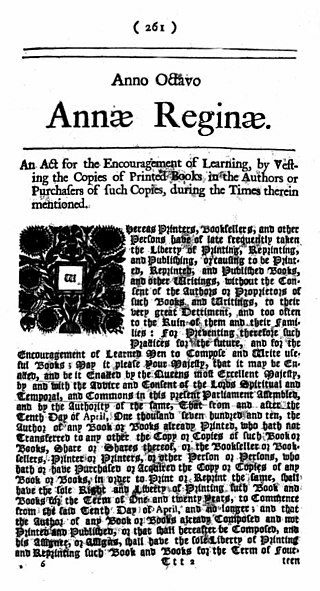 They argued for licensing to be reinstated, but with reference to authors – to guarantee them an income – and arguing that without the ability to make a profit from their work, “learned men will be wholly discouraged from propagating the most useful Parts of Knowledge and Literature” (stationer John Howe, 1706). Though the Statute of Anne was by no means perfect, and lawsuits arose after copyrights expired and other booksellers began printing works that had been copyrighted but not re-upped… yaddah, yaddah – it was absolutely the first time that the treatment of authors by printers was recognized and the first step toward a more public law - pressing for less monopoly on printing and therefore, simultaneously, easier spread of the written word. This entry was posted in Events, History, Uncategorized on April 11, 2018 by tavistock_books.